What do those three things have in common when it comes to table tennis? 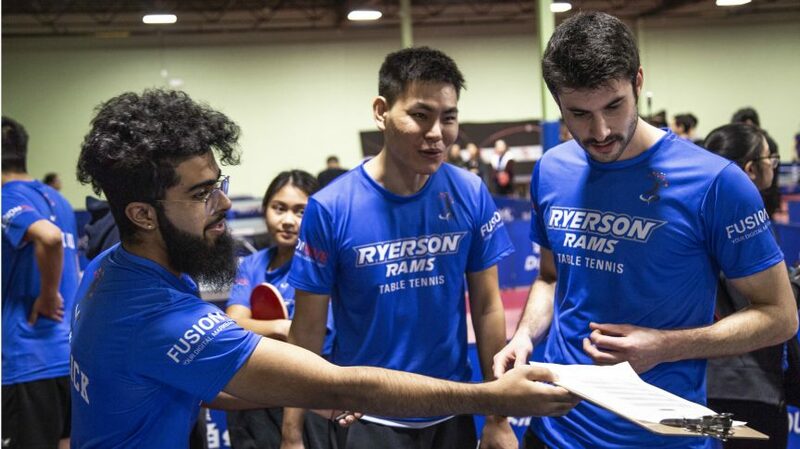 According to Ryerson’s squad, they mean almost everything. Loaded with a team full of energetic and high-spirited individuals, the group has relied on these three things throughout their five years of existence. Fourth-year environment and urban sustainability student Jack Hutton Hofmann says that reflexes might just be the most important of them, as it helps in aspects outside of sports. “Reflexes and coordination are a daily part of everyday life,” said Hutton Hofmann. “If you have [these skills], it helps your ability to make quick decisions.” Having played the sport since his high school days, Hutton Hofmann got his spot on the team after talking to the captain and founder, Mustafa Malick. After they finished playing, both Hutton Hofmann and Malick decided that they were good enough to start a legitimate team within the club. Four years later, the group now has two men’s teams (an A and B team) and a women’s team. It’s something Malick didn’t think would happen so quickly, considering the relatively low popularity of the sport in Canada. At a young age, Malick developed an interest in the sport. He played at the club, high school and recreational levels and was looking forward to playing at the collegiate level. Unfortunately, he quickly found out that Ryerson didn’t have a team. So, he decided to take matters into his own hands, as he worked with the athletics department to get the club started. After figuring out what he needed to do, Malick officially started the club in 2014. With both the club and the team rising in numbers, the group has managed to have a consistent turnout on a weekly basis. In their latest tournament in November, the squad travelled to Waterloo, where they finished third overall. But their solid finish wasn’t even the story of the event. Yumul, who’s been at the club for the last four years, also says that the club has managed to create meaningful relationships with other schools due to their team spirit. “It was our school against Guelph,” she added. “And it was basically the biggest possible cheer-off. Most people think the table tennis [crowd] is a mixture of tennis and golf…like most people think it’s pretty quiet.” The cheer-off got so intense that the game almost became an afterthought. After that, the two teams met up and ended up building a solid relationship with each other, something that Yumul attributes to the program’s willingness to have a good time. Given the overall growth of the program, the group is looking to one day make the team a varsity club. With over 200 members in the club and teams that have had a decent amount of success, Malick says that the goal that he imagined five years ago is slowly coming into fruition. Similar to most clubs, Malick understands that the process may never go through, but he still goes back to his “anything is possible”mentality.